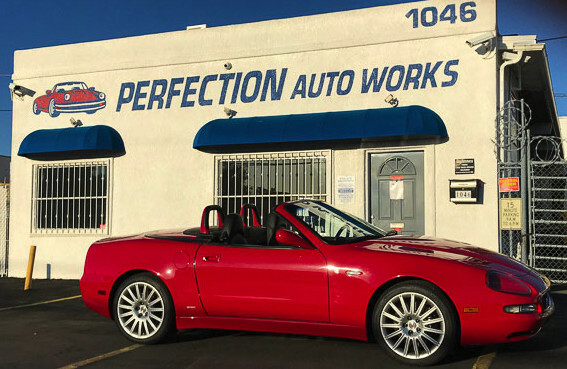 Perfection Auto Works is a Tucson BMW repair shop that specializes in BMW repair, BMW diagnosis, BMW engine overhaul, BMW service and maintenance, complete BMW electrical diagnosis, BMW alignment, BMW clutch replacement, BMW oil change, BMW interior repair, BMW parts and service. If you drive a BMW in Tucson, come see us — we'll take care of you and your BMW. We have over 20 years experience repairing BMWs in Tucson, 1 year parts and labor on all BMW repairs. I'm writing to tell you of a very pleasant experience I had talking with Mike Emery. Last Thur, I drove my BMW 330ci to Pinal Air Park and then back home to Oro Valley. I pulled into my drive, turned off the engine, got out, locked the doors and went into the house. Came out an hour later, unlocked the car with the remote, got in, put the key in the ignition and turned it to the "start" position-----crank, crank, crank, crank.----no start. I'm a long time car buff---owned and driven just about everything on wheels. Also, I am an Electrical engineer with a long list of patents for radio controlled garage door openers and many cordless telephone type products. I typically troubleshoot and diagnose vehicle problems when they present themselves. What to with this dead car in my drive?? Got out my BMW shop manual and went through the entire troubleshooting chart for a "no start" condition-----with no success. All i found was NO SPARK to the spark plugs. I could not find out why. beginning to sound like a computer issue ($$$$$$$). After 3 days of under the dash, under the hood, I gave up. I began calling several local repair shops in my area. When I asked for their opinion, all I got was comments like, "need a battery, need new coils, need a timing belt, need a crank angle sensor, need a fuel pump". One guy even said, I may have a frozen parking brake cable--would you believe it!!! Then I remembered you talking on the Swap Shop about how competent Mike Emery and Perfection Auto Works was. Gave Mike a call and explained my frustration about not being able to find the problem. I was immediately impressed by his analytical and professional approach to what my problem might be. Within minutes, he pointed me in a direction I hadn't considered and guess what! !---the engine started and purred like a kitten. MIKE EMERY IS ONE SMART DUDE. He has gained my respect and admiration as a truly great auto expert. 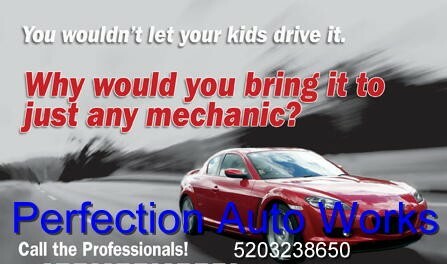 I am planning on getting all my future auto problems taken care of by Mike and Perfection Auto Works. I recently had my 07 525i overheat on me and had it towed to a mechanic I've had work on previous vehicles. He informed me that I needed a new fan and also a thermostat and the price just didn't seem right to me. After doing some research on other foreign car repair shops I found Perfection Auto Works. I gave them a call and talked to MIke Emery. He was very upfront about how unnecessary the prices I was being estimated were. I immediately wanted a second opinion on my vehicle. I took it to Mike and a few hours later he gave me a call letting me know I did need the fan and thermostat and would do it for hundreds less than I was quoted. I was extremely pleased with his information and knowledge of my vehicle, and the courtesy of letting me know the status of my car. All in all the experience with Perfection Auto Works was great! I have a VW passat that needs some work and I will be taking it there asap! Mike Emery is a consummate professional. He understands relationships and conducts business that way...not one & done. His mechanics have been there forever because they are very good at what they do and he treats them right. I have been quite happy with the repairs and maintenance performed on our 2 BMWs; and always at or below the quoted price. They are passionate about what they do and it shows. I don't normally write reviews, however over the last 5 yrs the level of service and attention that I have received from Mike and his staff have more than surpassed my expectations on every visit!!!!! Mike's refreshingly honest approach to the service needs of my vehicle have been a welcome change to my previous experiences with the automotive repair industry. I love my BMW 750li and depend on it for my business travels, which equal about 25000 miles per year throughout southern AZ. Not only does Mike and his crew handle my vehicles routine services in a timely and efficient manner, but anytime I have an unexpected problem he is always there to go above and beyond. He always does what I feel is his best to accommodate me and fix my issues. His prices are fair and he really stands behind his work with true customer service being the cornerstone of his business ethics. I've been taking my BMW 330i and my wife's BMW X3 to Perfection Autoworks for over 4 years now. Mike (the owner) has always taken the time to explain what needs to be done to keep our cars running in great shape - and the work his mechanics have done has always been excellent. 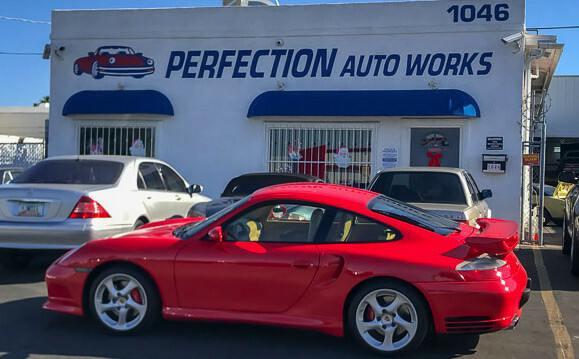 I would not take our cars anywhere else and have recommended Perfection Auto Works to all my friends who have higher end cars (BMWs, Mercedes, Lexus, etc.). My 330i has over 126,000 miles and my wife's X3 has over 165,000, both run like they are brand new and I attribute this to the great care Mike takes to insure that we are proactive in replacing parts that are worn, before they become a problem. I have such confidence in Mike and his team that both my wife and I intend to keep our cars until we hit 200,000 - because we know they will continue to run like new thanks to them! I recently had a 90,000 mile service done on my car and I'm extremely satisfied with the work done by Perfection. The car runs as good as or better than new. Perfection took care to do the work well, I inspected the car and it came back looking better than when I took it in. This shows the care the technicians take when working on vehicles. 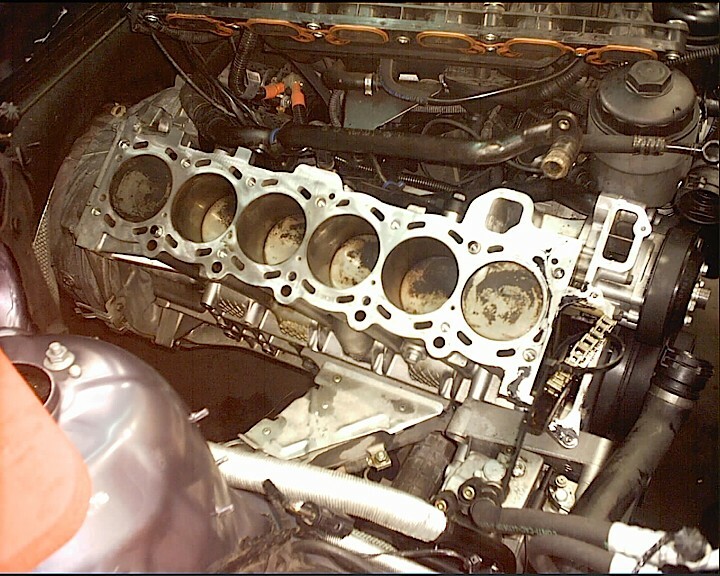 I also had my BMW 325i serviced twice by Perfection, the results were the same. I am a very satisfied customer and will return in the future for my service needs. Perfection Auto Works is the best in town. Every time I take my BMW, Mercedes, and Audi in for maintenance I sleep easy at night knowing that the job is going to get done right, at a great price, and that my family is going to be safe driving down the road. Perfection Auto Works is the only shop I will trust to work on my cars. I highly recommend them. Recently had the EGR cooler, MAF sensor, and various hoses replaced after "Engine Malfunction - Reduced Power" warning light popped up. Having recently moved to Tucson (and being only 2 miles away when CEL came on), I started at BMW of Tucson and spent 4 days trying to get a straight answer as to what was going on and how much would it cost. 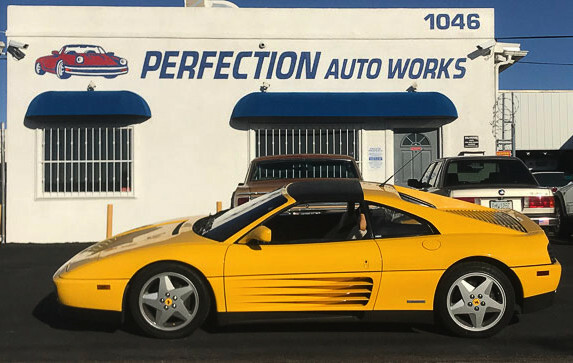 Read other reviews here; gave Perfection Auto Works a call; and had a solid plan/estimate within 12 hours that was $1000 below the dealership. Best of all - work was complete by end of next day and included car wash/vacuum/wax! Also noteworthy - Mike Emery stayed open an extra hour due to traffic/tow delays and even arranged for Enterprise to have a car ready for me - at a $29/day rate (special for his customers). Could not be more pleased with this team. Highly, highly recommend. We own a low mileage, immaculate 2005 330CI convertible that needed maintenance we were not even aware of. After Mike and his team inspected it thoroughly, Mike provided a very detailed, but clear and understandable, estimate for the repairs and compliance with the BMW maintenance/service schedule. Mike's estimate was broken down into options for us to consider: one option was to do all the maintaince at once; another option he provided was a progressive schedule to take care of the immediate issues in priority, thus allowing us to budget the rest of the non-critical items as we had time to work through. Mike also gave us the time to ask questions to make sure we completely understood all that he and his team were needing to do to repair our 330. Finally Mike gave an honest projection of the time his team would need to accomplish the work and kept us up to date the progress they were making during the time-frame he stipulated. On the exact day of the anticipated completion, the car was ready for our inspection and Mike's review of the work accomplished; comparing the final cost against the original estimates, and allowed time for us to ask any further questions. We drove away with a "new" 330; we received much more than we expected. Mike and his team are truly honest in every way; they know BMWs inside and out and have a passion for this brand of automobile. The 330 left their shop completely cleaned and detailed; there were items not even on the estimate that were attended to without charge. For every dollar one spends at Perfection, one receives three dollars in returned value. Mike is a "stand-up" man which is duplicated throughout his team. My first service with Perfection Auto Works. Four new tires and an alignment. Great BMW service. Mike is wonderful to work with. Work was completed sooner than expected. I purchased a 1999 BMW 328i that was in pretty bad shape. I had it towed to Perfection Auto Works and Mike Emory looked it over and put together a priority checkpoint list, along with prices. Valve job- cooling system was shot along with a plethora of other problems. I've done this BMW rebuild in two stages and Mike's been great communicating with me during this time. Mike and his guys did a great job, cars running great. This is the only shop that will work on my BMW or any other car. If you're looking for reviews for Perfection Auto Works, but this looks too long to read, just skip it and call Mike Emery now. But do feel free to keep reading. I bought myself a 2012 335i for Christmas and promptly hit a curb with one of the rear wheels at a high rate of speed. I know, I know... I'm an idiot, but it's my first turbo, ok? Anyway, up until that day I had never done any damage to any car, so I was in a panic. Plus, I'm a girl and, stereotypically, I don't know a lot about cars. So I spent hours wading through various BMW forums trying to get an idea of what kind of damage I'd done and what to do about it. What I learned was that 1) I should not take it to the dealer unless I was being forced at gunpoint, and 2) I had to spend as much time as possible praying that I didn't damage the subframe. Of course I had no idea where to take my car, so back to the forums I went. I found out about a lot of shops in town, but the name I kept seeing was Mike Emery. It was actually the comments on this very web page that convinced me this was the guy I wanted to deal with. I called Perfection Auto Works and Mike Emery himself answered the phone! He was super nice, didn't make fun of me at all, and told me to bring my car in the next morning. When I arrived, he said they were going to first drive it to see how it was functioning. But he took one look at how badly the one back wheel was tilted and said he didn't want to take the risk of furthering the damage. Before I left (someone from the shop drove me home!) Mike said as soon as he had some idea what the repairs would cost he would call me, but that it was possible this was a situation where I might want to make a claim with my insurance company. At that point, I was thinking that I'd end up paying thousands of dollars, if not because of extent of the damage, then because I'm a girl that doesn't know any better. So I really prepared for the worst--I told myself I'd pay for it myself if was $5000 or less, otherwise I'd have to get my insurance company involved. When Mike called later that day and asked if I wanted the good news or bad news first, my heart sank. I immediately asked about the subframe and he told me it was alright. Then he said a lot of stuff and talked about having to get a part from somewhere. I thought, great... it's going to be really expensive AND it's going to take forever. But he quoted me under $700 and said he'd call in couple hours when it was all ready. When I picked it up, he'd actually taken off $100 because he wasn't able to clear the codes for the DSC light and one other light. They ended up clearing themselves about 10 miles later anyway. At any rate, that was the first time I'd ever paid LESS than what I was originally quoted. Oh yeah, in hitting the curb, I made the rim look pretty bad--it was scraped up and actually had a little chunk taken out of it, about the size of a piece of gravel. Mike made it look like new, except for a tiny indentation where the chunk was missing. It hadn't even occurred to me that it needed to be fixed and I was very impressed with how thorough Mike is in his work. I couldn't have been happier with the condition in which my car was returned to me. I would recommend him to anyone needing work on a BMW, and especially to ladies who have concerns about being ripped off by mechanics. Mike Emery does impeccable work, plus he's honest and trustworthy, as well as friendly and kind. You really can't ask for any more in a mechanic. 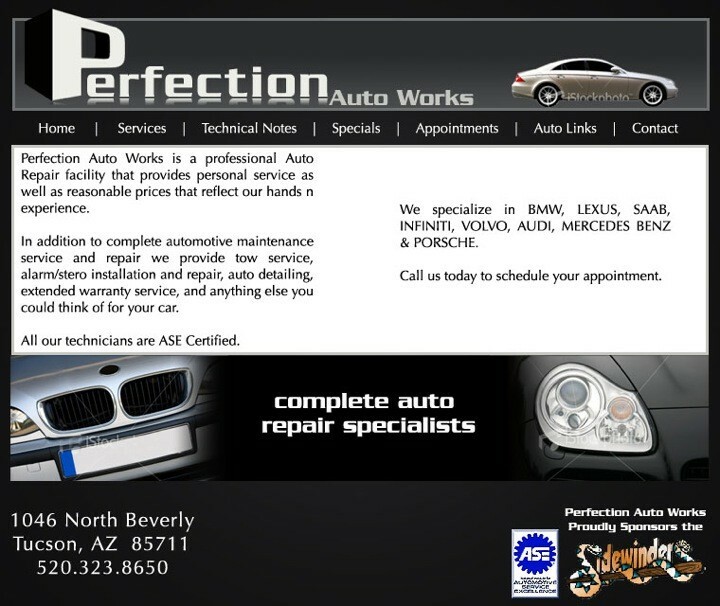 Perfection Auto Works is the best BMW repair shop in Tucson. I have been taking my cars here for over 10 years. I also have my girlfriend and several co-workers coming here now too. It's hard to find a trustworthy, reliable, and cost effective mechanic. Your search is over because I'm convinced that Mike and the group at Perfection Auto Works can fix anything. When I was looking at buying a BMW, I had the seller take the car to Perfection for an inspection. The test was comprehensive and 3 years later my Bimmer is still running strong. My truck has 150000 miles on it and runs flawless. Kudos to perfection for doing the job right and keeping me on the road. Without hesitation, Perfection Auto Works gets my highest recommendation. 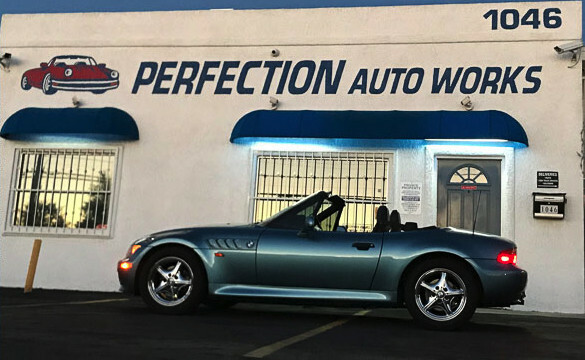 Hi, just thought you might like to know that Perfection Auto Works made my BMW Z4 run like new! The check engine light had com on and I could not get it through emissions. Perfection diagnosed the problem, repaired it at a fair price, and even took it through emissions for me! These guys really are good ! I was always in the loop as far as cost, time frame, and completion. I highly recommend Perfection Auto Works for not only BMW repair, but they also did repairs on my husband's Mercedes with the same great results! Thanks Mike Emery and the guys at Perfection Auto Works for a good auto repair experience! For a few years my son was a student at the University of Arizona which-as many of you may know, gave me the challenge of finding a trustworthy, professional, honest and competitively priced auto shop. 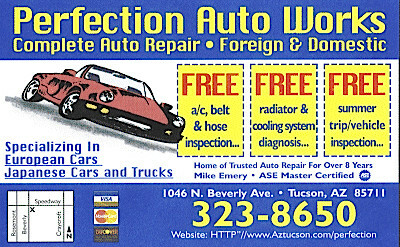 My mechanic in New Jersey and I checked the Tucson area and came up with Mike Emery and Perfection Auto Works. On more than just a couple of occasions my son took his car there and the work was always done in a timely fashion and we were always completely satisfied with the work performed. On the last occasion the car had a large amount of work done and when it was shipped back home we were amazed at how it looked--it was like we just picked it up at the showroom. In these days of "rip-offs" there are two professions where the most important important credential to me is "do you truly trust the person performing the service"--those are auto mechanics and doctors! Mike and his team certainly have earned our true trust. It always pays to have an auto repair shop that is concerned with the reliability of your automobile. Addressing current problems and diagnosing future difficulties is the key to satisfied customers. 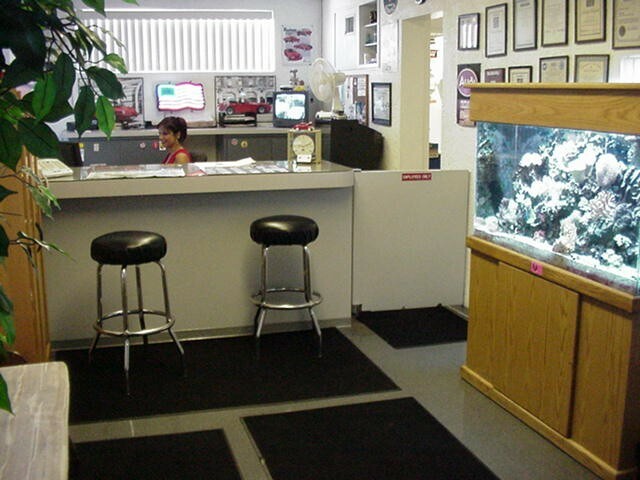 I have taken my cars to Perfection Auto Works for several years and received excellent service on each visit. Mike and his staff have never failed to diagnose the current problem correctly and remedy the problem in a timely manner. Communication concerning all phases of the repair is always up front and accurate. Very comforting to know Mike is just a telephone call away. If there are 5 stars, you get 5 and if there are 10 stars you get 10. My 2001 325XI runs great after the work done on it at Perfection Auto Works. Because I was from out of town and in a bind, Mike fit me in despite their busy schedule. He explained the problems thoroughly and provided excellent repair work. I recommend this shop highly for their high quality work and wonderful customer service. Even the floor mats were cleaned at no extra charge. I love Perfection Auto Works because they care about me and my Bimmers. I own a Z4 with 26,000 miles and have taken this car and my M3 to Perfection Auto Works for aprox 4 years. I'm happy to report NO PROBLEMS with the owner, the repairs, or the cost. All work has been done in a fast and honorable fashion. All estimates have actually been higher than the actual bill ( nice surprise !) I used to go to a different shop before I found Perfection Auto Works and had nothing but problems. 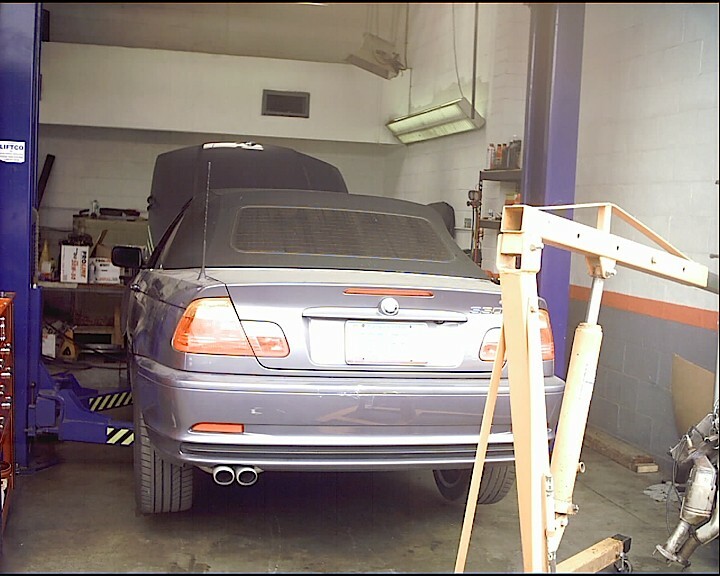 Perfection is very good at BMW repair, and also make the auto repair process a very pleasant experience. I highly recommend this shop and will continue to take my cars to Perfection Auto Works. They always do a free 26 point inspection, and back their repairs with a 1 year, 12,000 mile warranty. I have had nothing but fair, honest value at Perfection Auto Works, and I'm sure you will too.